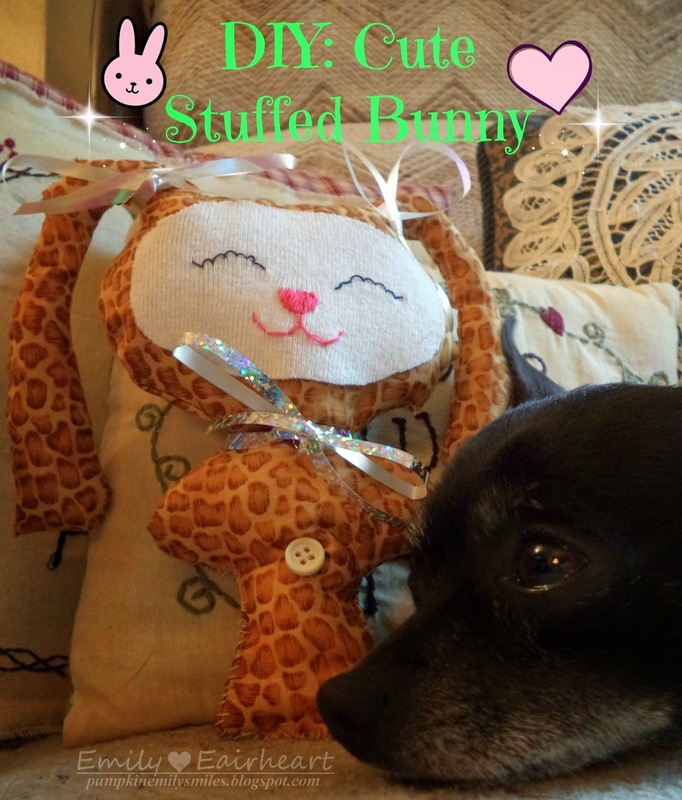 Here's a fun and cute little stuffed bunny DIY. It would be great for a gift, decoration, or just something fun to do. You can even make your bunny any size or color you want to. The first thing you want to do is to make your pattern. Fold the paper in half and draw the shape of your bunny. One thing that I recommend is to put dotted lines around the shape of the bunny because that's where the stitches go.If you don't put the dotted lines there then the bunny will be smaller than your pattern. After you made your pattern cut along the dotted lines with scissors. Fold your fabric in half so you will have both the front and the back of your bunny have even sides. Then place your pattern on the fabric and pin it to it. After you pin the bunny to the fabric, cut it out using scissors. You should now have two bunny shapes cut out. They will be used for the front and the back. Now, place both bunnies on top of each other and pin them together. The top side of the fabric should be touching each other. The bunny will need to be like this because the seams won't show. Then sew them together by hand or by sewing machine. REMEMBER: Keep an opening for the stuffing! After you sew both sides together you need to flip the bunny inside out. You can use a fast turn device that makes it a lot easier to turn the bunny inside out. It really helps for the ears. For the face, I used an old white t-shirt but you can use fabric. Cut a oval shape that will make a face for your bunny. Also cut the same shape out of the the adhesive. Draw a face on the white fabric with a pencil and then sew the face on with colors of your choosing. Before you put the face on, put on the adhesive and after you that put your bunny face on over the sticky part and then iron over the face so it will stick. Put the stuffing inside your bunny and then close your bunny up by sewing your bunny. Decorate your bunny with anything you want. Buttons, ribbons or anything else. Here's my bunny, I think she came out pretty cute. It's so cute! What a wonderful blog; it never fails to cheer me up. awesome diy! she looks so peaceful and content lol love it!